Following the controversial news that Florida police were using mugshots of black men for target practice, Lutheran clergy responded on social media by offering officers pictures of themselves as a replacement. The social media campaign, started under the hashtag #UseMeInstead, snowballed online as people took notice. More than 60 clergy responded, with the photos being mailed to police. A closed Facebook conversation by Rev. Joy M. Gonnerman and other Evangelical Lutheran Church clergy began by asking how to respond to what they saw as a deep, systematic problem – the fact that local police were discovered to have used pictures of mug shots of black men at a gun range. The controversy began when National Guard Sgt. 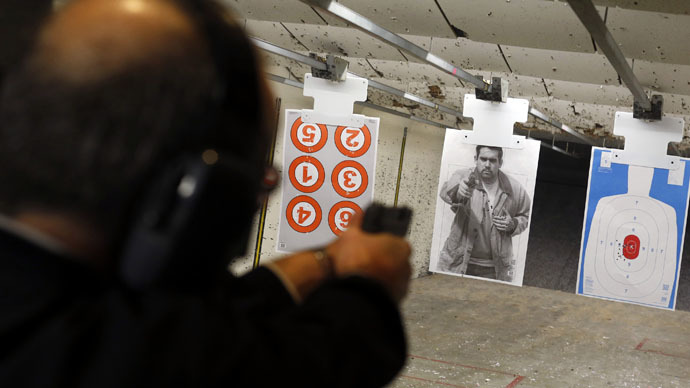 Valerie Deant visited a shooting range in Medley, Florida in December, and found that North Miami Beach Police had been participating in a shooting drill using the actual photographs of six black males as targets. What was even more shocking to Deant was that one of the images was of her brother, Woody Deant. "Maybe we ought to make it hard to pull the trigger, and volunteer to put pictures of their family up," Gonnerman said, according to a report by Local 10. Another poster said she would send a photo of herself to the police department. The group then created a Facebook event, which invited friends to post picture of themselves in their clerical clothing. The effort picked up steam when people started tweeting images of themselves using the hashtag, #UseMeInstead. "Essentially," she told Local 10, "we're saying: We're watching, we're paying attention to this." After being notified of the trending hashtag, North Miami Beach Councilwoman Barbara Kramer told WLRN that she doesn’t think police will be using a “real face” for target practice in the future. “Thanks so much for the offer, but we’re not interested in using anyone’s real face,” she said. The story was first reported when Sgt. Deant told WTVJ about her discovery. "I was like, ‘Why is my brother being used for target practice?’” she recalled. The revelation led to a press conference last Monday protesting the practice. A demonstration on Tuesday expressed further anger with the situation before City Council officials apologized and then voted to ban the practice. But protesters said that wasn't enough, and asked for Police Chief J. Scott Dennis to be fired. "I've had to live and relive seeing a bullet through my forehead and a bullet through my eye at the hands of the North Miami Police Department," Woody Deant said at the news conference last Monday outside City Hall. He added: "I am not a mug shot. I am not the tragic mistakes I made 14 years ago that costs the lives of my friends and my clean record and my freedom. I do not deserve to be a target for sport as a training exercise." For their part, police said they will end the use of real mugshots. "This sort of mug shot has been suspended indefinitely and ceases to exist as part of our training," Dennis said. "A policy change has been initiated and the new procedure will be that no one will be shooting photographic images in the future."